They don’t seem particularly useful. If there’s something I should be doing that I’m not already doing, the solution isn’t to make a resolution, but to figure out why. When we don’t do something we think we want to, or think we should, it’s usually because we lack the motivation. We don’t really want to. When we’re motivated, I believe, we do whatever it is – we accomplish, no resolution necessary. But I think I might make one this year. Not because it’s something I feel the need to do, but because it’s a way of expressing something that I think has been happening over the course of the past year, and that I want to express. My resolution for the next year is to become myself. We spend so much of our lives accreting. As we grow up, we gain knowledge, qualifications, traits we think we ought to have. Sort of like rocks in the ocean that slowly, over time, are covered with seaweed, barnacles. We gain all those things, and yet underneath, our shapes disappear. I think there’s a time in your life when you need to start getting rid of the accretions that obscure your natural outlines. When you need to start figuring out who you are under all the things you’ve been taught, and have adopted without necessarily thinking about whether they’re authentically your own. I know I’m not explaining this very well. It’s because I’m stumbling, not entirely sure what I’m talking about. I’m writing out of an instinct that this is the time when I need to do that, figure out who I am and become it. When I need to find my own voice. I was looking back through some photographs from this past year, and a few from Thanksgiving, when I was in Virginia, seemed to express where I’ve been this year, and where I’m going. Looking out the window. What possibilities are out there? This is where I started. Going outside. The world suddenly seemed so much larger than I had thought. And so I sat for a while, looking around, trying to get a sense for which way to go. Across the fields. I was heading somewhere, although I wasn’t exactly sure where or why. And this is where I am now, I think. On some sort of fence, some sort of boundary. Headed toward the woods? I don’t know. But it’s me, and it’s my journey, and I’m making it. That’s my resolution for the year. I can’t even begin to tell you how inspiring your blogs are. 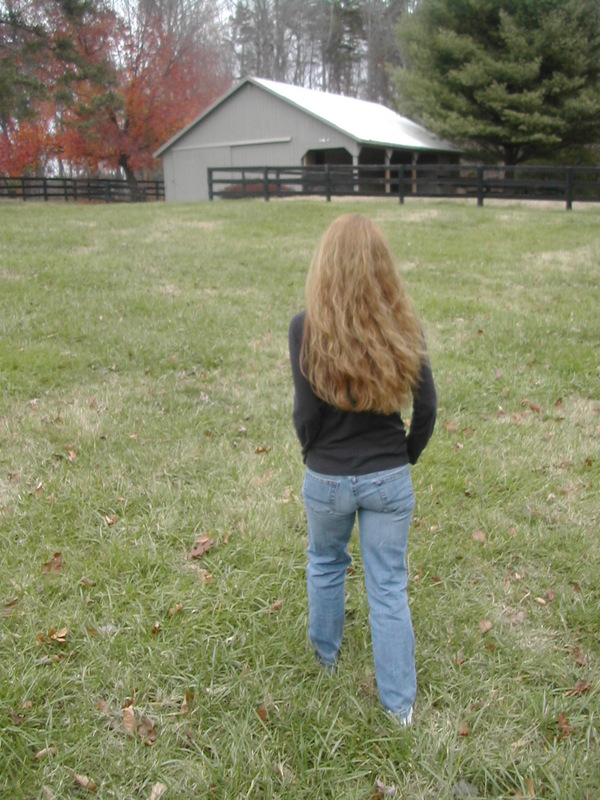 And those photos, the calm they emit, your denim and the rural land, and that flowing red hair . . . uh, er, plus the fact that your writing is so graceful and your life story so . . . something I can’t put my finger on. Thanks, Brady! 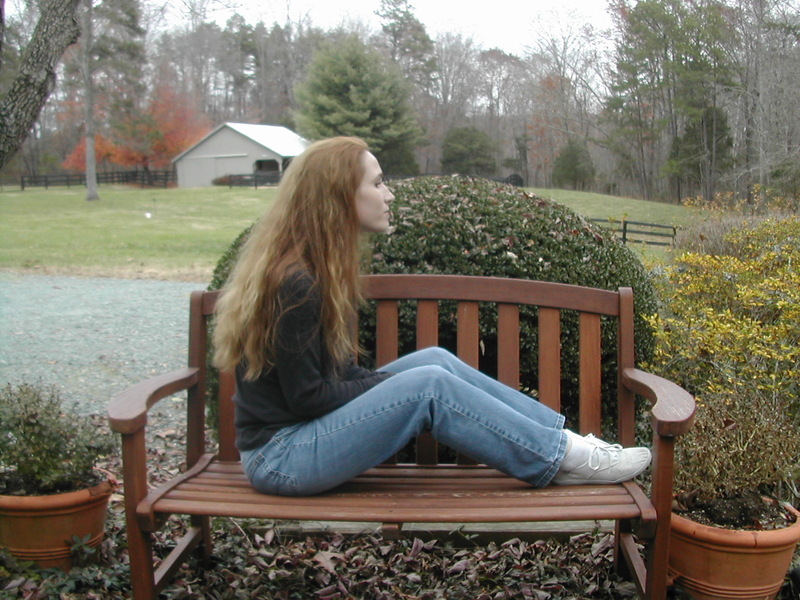 The photos are calm, but that’s because I’m always calm in Virginia, so unlike my frantic life in Boston. Give all the credit to that red earth and the green trees . . . I found you through Duncan Long, Theodora. I am subscribing, and will read your blogs slowly, as I find time. Your work is nicely worded: something rare.